Slovenia, Turkey, Austria and Switzerland as well as the US army forces on Kosovo have joined Croatia and Slovenia and offered to help Macedonia in fighting fires that have been sweeping across the country for days. Macedonian PM Nikola Gruevski announced this today, informing that "help from Croatia has already arrived and we are expecting the Slovenian helicopter to land any moment now". He added that Turkish Canadair and a helicopter and one more helicopter from Austria are due to arrive in Macedonia by tomorrow morning. 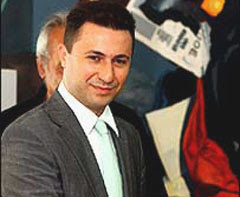 "We are doing everything in our power, but while we fight to localize the existing ones, new blazes are breaking out at many locations scattered all over the country", Gruevski said.